Available in 400g and 2.5kg bags. Ideal for tadka, hotdogs, burgers, curries, mash potato topping, on salads or in soups, as a garnish or simply as a tasty snack. 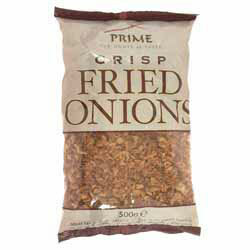 Ingredients: Onions (76%), Vegetable Oil, Wheat Flour, Salt. "Dear Spices of India, Superb quality tableware, a fantastic range of Indian herbs, spices and foods, very good packaging, fast delivery, excellent communications and the main thing, a personal touch as well if you need anything different. Well done Spices of India!! I will definitely be using you again."